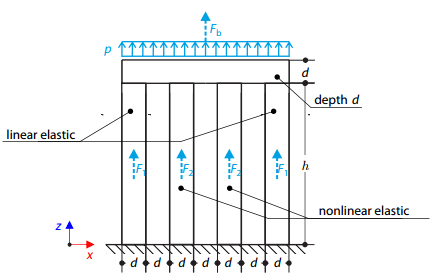 A thin plate is fully fixed on the left end and a uniform pressure is applied on the top surface. 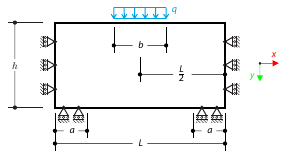 Four columns are fixed at the bottom and connected by the rigid block at the top. Block is loaded by the pressure and modeled by an elastic material with high modulus of elasticity. 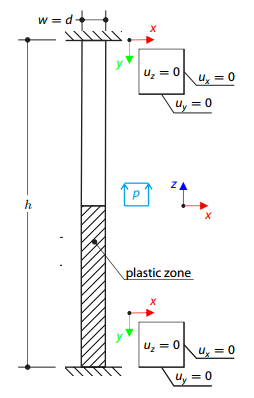 Outer columns are modeled by linear elastic material and inner columns by a stress-strain diagram with the decaying dependence. Assuming only small deformations theory and neglecting structure's self-weight, determine its maximum deflection.